Figure 4 Magnetic navigation. (a) The magnetic field properties of different locations on Earth can be mimicked by sending appropriate currents through an arrangement of coils. (b) Adult turtles, which are tethered in a large swimming pool and are subjected to a magnetic field characteristic of places several hundred kilometers north or south of their home ground (marked by blue dots), swim in directions that indicate that they perceive themselves to be north or south of their home grounds. (c) Turtle hatchlings which are subjected in a similar way to magnetic fields that indicate different locations across the Atlantic Ocean swim in directions that would keep them in the large Atlantic gyrus. (a) From http://www.unc.edu/depts/oceanweb/turtles, with kind permission of Kenneth Lohmann. (b) Modified from Lohmann KJ, Lohmann CMF, Ehrhart LM, Bagley DA, and Swing T (2004) Geomagnetic map used in sea-turtle navigation. Nature 428: 909-910. 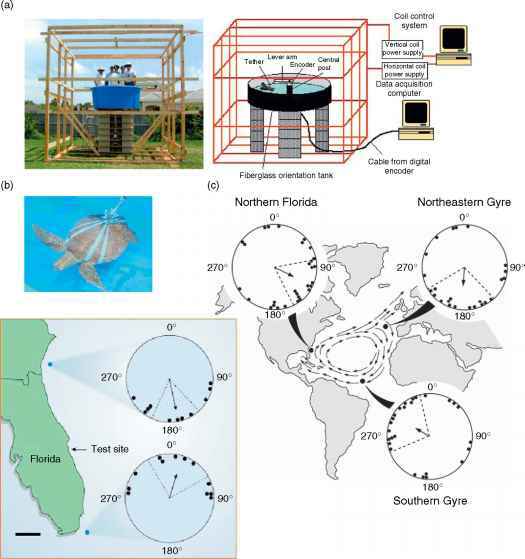 (c) Modified from Lohmann KJ, Cain SD, Dodge SA, and Lohmann CMF (2001) Regional magnetic fields as navigational markers for sea turtles. Science 294: 364-366. Sun is not visible. Equally, some birds calibrate their magnetic compass using the twilight sky at the horizon; other birds calibrate their twilight and star compass with the aid of the magnetic field. Compass cue hierarchies thus differ in each specific case, possibly depending on the way experiments are conducted, but also depending on the evolutionary history and the peculiarities of migratory behavior. Figure 5 Global navigation. Wandering albatrosses go on a year's sabbatical after breeding on Crozet Island. Two positions per 24 h cycle are shown for two male (mauve dots and blue triangles) and two female birds (red dots and yellow squares) as determined by light-intensity loggers. Each bird flies to its favorite wintering zones somewhere across the Southern Ocean. Modified from Weimerskirch H and Wilson RP (2000) Oceanic respite for wandering albatrosses. Nature 406: 955-956.
movements by insects, in which information derived from path integration, from the visual scene, and from olfaction interact. Honeybees, for instance, learn, remember, and recall navigational instructions, when they encounter certain patterns, colors, or odors along a foraging route. 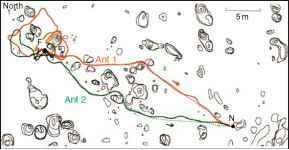 Desert ants (Cataglyphis) can retrace their steps in complicated terrain, always detouring vegetation or artificial landmarks in the same direction on repeated trips (Figure 6b). Wood ants (Formica rufa) are attracted by dominant landmarks as beacons and route guides, but can follow the same route even in the absence of such a landmark, indicating that they learned as well a sequence of other cues that defines their foraging path. The foragers of the giant tropical ant (Paraponera clavata) ignore their own pheromone trails when they become more experienced with a route to a food source and rely themselves on route landmarks, while fresh recruits are guided by the trail. These examples highlight several important aspects of animal navigation that are little or only partly understood: the organization of navigational memory, the saliency and reliability of navigational cues, and the relative importance of genetically determined navigational instructions and of navigational learning. Large-scale migration routes in birds have been shown to be determined by genes that influence migratory direction, while the ability to pinpoint nest and food locations has to involve learning and memory mechanisms. The close similarity of the complex behavioral organization of learning flights in phylogenetically distant species of nest-owning bees and wasps, however, suggests that the rules of how to learn about the visual scene around a goal have a genetic basis. In recent years, a lively debate was concerned with the following question: what kind of internal representation do animals have of the different environments they navigate through? Is the knowledge they have similar to how we perceive the lay of the land, having been trained to read and interpret maps, which are basically bird eye views of the world.? Or do animals know the world only as a set of paths and places they have traveled before, but without the ability to determine the shortest paths between these places? The debate revolves around the concept of a 'cognitive map', the organization of the internal representation of space. In its hard definition, a cognitive map would mean that animals have a representation of the x-y-z coordinates of the landscape, much like a topographic map. In a milder version of the definition, a cognitive map is any representation of the physical environment that allows an animal to navigate through it and to visit places ofinterest. One ofthe crucial experiments that were designed to test whether animals possess one or the other representation, involves training bees, for instance, to visit two locations that are some distance away from each other and then displacing them to a location halfway between the two training places, which is assumed to be unknown to them. The question then is whether the bees fly directly to one of the known places, which would indicate that they were able to judge where the release location lies with respect to the training places. Such experiments and variants of it have so far not provided clear evidence, at least for bees, that they possess a topographic map-like representation of their environment. Similar experiments with dogs show that these animals do take shortcuts between two places they know, possibly using path integration information. In contrast, insects seem to represent the environment they exploit as a set of instructions on how to reach and trap-line significant places from their nests and hives, but with no ability to take shortcuts between them. This question ofhow navigational knowledge in different animals is organized is still open and provides an inspiring and motivating challenge to scientists interested in the mechanisms of animal behavior. Figure 6 Landmark guidance. (a) Homing pigeons are attracted to and are guided by large landmark features, such as roads or large road crossings. Red lines show the GPS-recorded paths of pigeons on their way back to the loft; green lines mark major highways. (b) In terrain with vegetation, two desert ants (Cataglyphis; green and red) had returned from a feeder at (F) to their nest at (N) along the dotted paths. They were then picked up and returned to the feeder. After some search, both ants practically retraced their steps (continuous red and green lines). 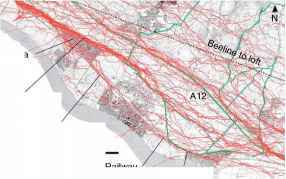 Since Cataglyphis does not deposit pheromone trails, this experiment shows that they must remember route landmarks. (a) Modified from Lipp H-P, Vyssotski AL, Wolfer DP, et al. (2004) Pigeon homing along highways and exits. Current Biology 14: 1239-1249. (b) Modified from Wehner R, Michel B, and Antonson P (1996) Visual navigation in insects: Coupling of egocentric and geocentric information. Journal of Experimental Biology 199:129-140.